Kofi Siriboe as Ralph Angel, Dawn-Lyen Gardner as Charley, Rutina Wesley as Nova. “So Far” is exactly what we needed. It’s impossible to watch Queen Sugar and not see the parallels to America’s current political climate, and yet, this episode offers us a hopeful, valuable message. Watching the Bordelons commit to their family’s legacy is, in its own way, an opportunity to take a breath, collect ourselves, and consider our way forward. Violet is turning over a new leaf, no pun intended, thanks to her talk with Nova about doing more for herself. After Charley insinuates she keeps Micah in private school so he won’t end up like Vi, a member of the working-class poor, she doesn’t wallow in hurt feelings. Instead, she goes to the High Yellow Diner and demands a job as manager, with benefits and year-end bonuses. She uses Charley’s hopes for Micah as motivation to realize her own dreams. Hollywood congratulates her on the promotion and she gives him a cup of coffee, her version of a peace offering. Meanwhile, Ralph Angel is frustrated he’s not allowed to sign Blue’s permission slip for a school trip because Violet is still his legal guardian. He confronts his aunt, telling her he’s done his time in jail and has been with Blue every moment since he got out, but having to ask her permission for his son to do anything tears him apart. “When do I get out? When am I done?” he asks. Ralph Angel’s time in jail haunts every corner of his life, and when Violet sees how much it hurts him, she finally signs over guardianship. She tells her nephew that she is always there for him and there is no shame in asking for help. Queen Sugar showrunner Ava DuVernay has a special place in her heart for uncovering the corruption of the prison industrial complex in America. Her film Middle of Nowhere addresses the issue, and so does the documentary The 13th, which is currently streaming on Netflix. More than six million Americans were unable to vote in this year’s presidential election because of felony disenfranchisement. How long does a person have to pay for his or her crimes, even after serving time? Every day, Ralph Angel gets a reminder that he’s still considered a criminal. Millions of real people face that same reminder. Micah’s new private school finds out the reason why he was expelled from his last school, and it may prevent him from enrolling. Vi argues for St. Josephine High School, which his crush Keke attends. They’ve been hanging out, so Micah is getting a lesson in Southern black-girl magic and the expectations of courting in the South. Keke is direct: When Micah tries to be cool and say, “I guess I’ll see you around,” she shoots back, “Why guess when you can know?” Later, when he clearly wants to kiss her, she says, “Life is short and I gotta go home.” In other words, make your intentions plain and show your commitment. It’s something even Hollywood knows. He’s filed for divorce from LeeAnne because he wants to show Violet that she’s worth his full commitment. Micah’s love life may be blooming while Violet’s is healing, but Nova’s is falling apart. She is set to speak with Melissa Harris-Perry about her investigations of police corruption and migrant workers, but Chantal sees it as an opportunity to instead promote the Black Lives Matter movement. She tries to offer talking points, but Nova doesn’t want her help. Chantal thinks Nova is being self-serving, but even more, she can’t accept the fact that Nova still has feelings for a white cop. Chantal tells Nova she can’t claim to be for the people while in bed with the enemy and ends their relationship. This is not the first time Nova’s work and love life have left her torn. And honestly, it’s so refreshing to see a show acknowledge and push the issues that arise in interracial relationships. As shows become increasingly diverse, we see more interracial relationships on TV and too often, the complications get ignored in praise of color-blind casting. It’s not just cultural differences people have to deal with; it’s how people perceive them and those perceptions can affect professional relationships. Scandal acknowledged the racial tension in Olivia and Fitz’s relationship in season two, when Olivia asked Fitz if she was the Sally Hemings to his Thomas Jefferson, and the audience gasp went ‘round the world. It’s important people see that interracial relationships are not kumbaya events, meant to heal the world of racism and strife. Nova tells Chantal she loves people for who they are. That kind of love can lead to external issues, and I’m glad to see Queen Sugar acknowledge as much. While Charley tries to get a handle on Micah’s school situation, she’s also working to find a mill to grind up the sugarcane harvest. She meets with Jacob Boudreaux, who owns Boudreaux Mill with his brother. He offers her a 40-60 deal in the farm’s favor, but it’s still a very steep percentage. During negotiations, Charley shows her hand and says she and her siblings are trying to get the Bordelon farm to prove it’s viable so they can sell it at the best profit. Jacob turns up the charm and gives Charley a tour of the mill, where she learns more about sugar production after it leaves the farm. Although it’s clear Jacob is trying to schmooze Charley for the sake of business, there’s also a little moment where he suggests he wants to learn more about her personal life. Is he hitting on her? Maybe so, because a little later, he stands very close while making an offer he’s sure she won’t refuse. Charley takes the offer back to the family, including Prosper, the farm manager, but interestingly enough Remy is not included in this meeting. Jacob has offered to buy the Bordelon farm for $4 million, which is six times what Landry offered. The catch? The Boudreauxs married into the Landry family, so they tend to work together to gobble up farmland and make life hard for any farmer who isn’t related to them. Charley is suspicious of the offer and researches old maps. The Boudreauxs and Landrys own all the land around their farm. She discovers that Bordelon land used to belong to the Landrys. She wonders what happened and why they’re so intent on getting it back. Violet and Prosper reluctantly reveal a harrowing yet familiar part of Bordelon family history. The Landrys owned Bordelons during slavery and let them sharecrop the land after abolition. When the Landrys fell on hard times during the Great Depression, the Bordelons bought some of the Landry land. However, when the Landrys became flush again, they claimed the sale never happened and tried to get the land back. The Landrys lynched some of the Bordelon men, including Ernest’s older brother. The bank finally found the title, attesting to the Bordelons’ rightful and legal ownership, but the Landrys and the Boudreauxs did everything they could to make farm life hell for the Bordelons. Charley, Nova, and Ralph Angel are distraught. At first, they were excited about such a significant offer for the land, but now they know the truth, they refuse to accept it. The three gather to look out over the farm, the land that was paid for with the blood of their ancestors. “No more running. We ain’t going nowhere,” they vow. It’s a powerful moment, and it mirrors the way many people feel now that a man endorsed by the KKK is the president-elect. If the Bordelons can fight back, we all can. We ain’t going nowhere. The history of the Bordelon farm is filled with ugliness and hate that cannot be denied, just like the history of the United States. When you commit to being an American, you take on its complicated history as well as its victories and benefits. If you’re asking, “How did we let this election happen?” you have to be ready to learn how the past feeds the present. That is the way forward. 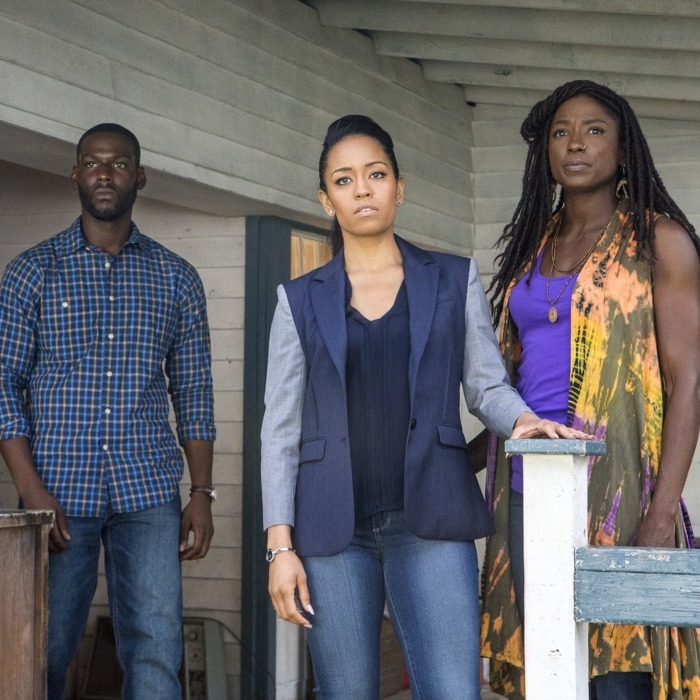 Queen Sugar reminds us of this: Armed with knowledge about their family history, Charley, Nova, and Ralph Angel vow to create a new legacy for the Bordelon name. Not only to overcome the past, but to honor their ancestors. It’s a lesson for us all to remember.